Open: May & June, mon-fri, 10.30-5pm, July- Oct, thurs & fri only. The drama of the setting increases as you approach. garden clinging to the south-facing seaward side, with salt-tolerant and sub-tropical species thriving. On the north side, the slope is less steep and shelter provided by the central mound of rock allows light woodland and an understory of shrubs, including rhododendrons and camellias. It is a wonderful and remarkable place to visit. Adult £3, child £1. Plant sales. Toilets. Cafe. Shop. No dogs. -21/2 miles east of Penzance. 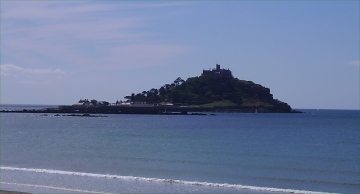 Car park in Marazion. NB: WALK ACROSS TO ISLAND AT LOW TIDE, ferry in summer only. Phone for tide & ferry times 01736 710 265.